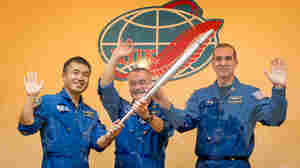 November 6, 2013  The Olympic torch was launched into space on Wednesday night. It will accompany astronauts on a spacewalk before returning to Earth on Nov. 10. May 10, 2012  The Olympic flame is lit in Greece using a mirror to reflect sunlight into the torch. The flame will be carried through Greece until May 17, when it's handed off to London Olympic organizers for a lengthy relay race across the UK.